Students often say that Matsuyama University fees are low. Intuition may tell us that’s probably right, but what happens when we look at the figures? A comparison with other universities, made to find out whether or not this is true, revealed that the fees really are low! Private universities are not a monolith – large discrepancies come into play when discussing the high fees for medicine or dentistry, so we will compare the first year payments. These include an enrolment fee, tuition fees. The minimum that is usually paid on enrolment is the enrolment fee and the tuition fees for the first semester, or for the full year. 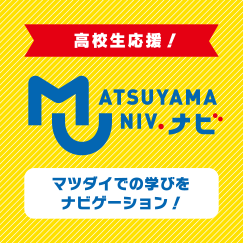 This is where Matsuyama University tuition fees are different from the average private university! You probably know this already, so let’s compare our fees with national universities. There’s only a surprisingly small difference in the cost! This gives peace of mind to parents sending their children away for the first time. Faculty of Pharmaceutical Sciences fees are as above. Tuition fees include all experiments, practical training and all long-term practical work experience and training in a medical setting, and fees for preparation for the national examination for pharmacists, and therefore there are no further charges for practical training. The scholarship system is a system under which grants of full or half tuition fees are given to students for high performance in academic studies or extracurricular activities. Scholarships are available for entrance examination takers and enrolled students. For particulars please inquire at the Student Division.